The great peak of Langtang Lirung (7246m) dominates the upper valley and straddles the Tibetan border, in spring to spot the various birds and blooming of flower makes the trip more beatifies the trek. Our itinerary also combines with the holy lake of Gosainkund, an pilgrimage place of Hindu religion. As per a legend, Shiva, Hindu god once swallowed all the poison to save the world and to quench his thirst he happened to be here. The trail goes through tropical forest and by evening put you in the middle of a freezing alpine landscape. Stunning views of Langtang Lirung (7246m), Ganesh Himal(7146m) and Dorje Lhakpa (6990m) peaks are the reward for the trekkers. Service Excludes: lunch/dinner at Kathmandu, laundry, telephone calls, emergency evacuation if required, donation, tips and all personal nature expenses. Day 03	Kathmandu to Syabrubensi : After breakfast we get into the bus to start our journey. 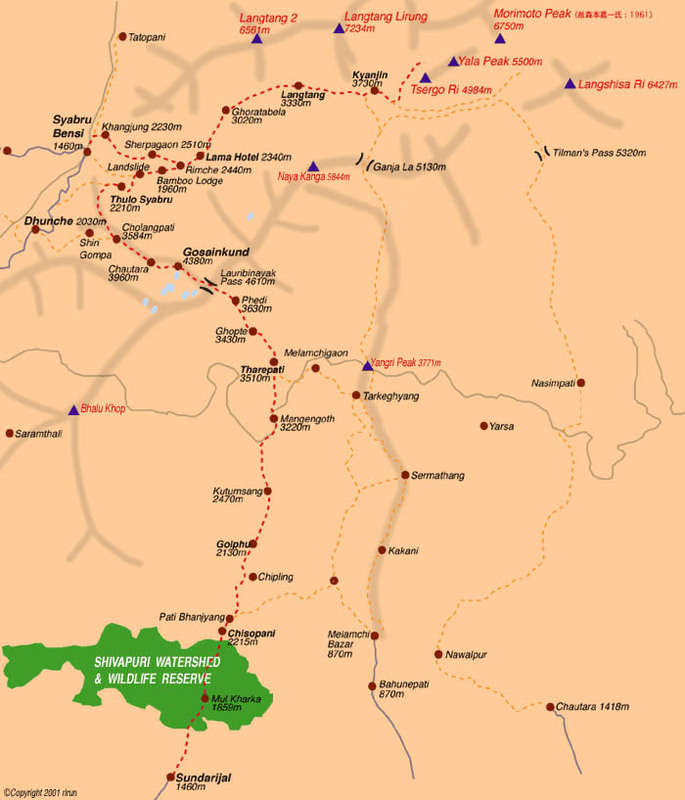 It takes about 8 to 9 hours by bus via Trishuli Bazar to reach Syabrubensi. On the way at Kakani, excellent views of Annapurna II, Manaslu and Ganesh Himal. Lodge at Syabrubensi . Day 04	Syabrubensi – Syarpa Gaon: The trail follows the left bank of Bhote Koshi, ascend the steep trail and later on narrow path to the left which leads to Syarpa Gaon. The trail is through the cultivated field, climbing to the Tibetan Village of Kakdingma, where very few reside. Soon, you start ascending leaving Bhote Koshi behind, and still long climbing up reaching to the ridge called Bhanjynag ends the Bhote Koshi. After enjoying the scenery around start descending having the views of Gosaikund ahead, descending down with the wind and from the main ridge comes to the small mountain village of Syarpa Gaon. This will be the perfect place to halt for the day. We stop overnight here. 5.30 hours walk. Day 05	Syarpa Gaon- Ghora Tabela (3010 m): After a short distance from the start point you approach the riverbeds: following the stream and climbing up for a short while you come to the Lama Hotel (2400 m). Now we enter the forest from which you occasionally can catch glimpses of Langtang Lirung. The trail is gentle ascent and the elevation gradually increases. The short steep climb of the hill from the river path, the valley gets widened and soon you are at Ghora Tabela (3010 m). The night stop of our today’s destination at the lodge available there. Day 06	Ghora Tabela - Langtang Village (3500m). The trail ascends gradually, as the valley becomes a classic wide U shaped glacial valley. The path in the meadow and steep ascent will come to see rocky Yala Peak (5033 m) and through two hamlets Thangsep & Chamki. Reaching here and having the nice views of Yala Peak & Ga (6387 m) we descend, crossing streams and climbing past several water driven mills, walls and prayers wheel to the large settlement of Langtang Valley (3500 m), today’s night stop. 3.30 hours walk. Day 07	Langtang Village - Kyanjin Gompa (3800m). The trail climbs onto a ridge dominated by a large chorten and a long row of mani walls, then gradually climb and pass through the village of Mundu & Sindum, then continues through yak pastures of Yamphu (3640 m) as the valley widens. After crossing Laja Khola and climb a moraine to a view point where Kyanjin Gompa appears. The trail through rock and climb toward Gompa and with short descent to a large cluster finally we come to Kyangjing Gompa, Short hike but Today’s night stop place, also famous for producing the 7000 Kg of Cheese per year. 4 hours walk. Day 08	Rest day Relax around at Kyanjin Gompa or you may want to hike up the moraine for getting a spectacular view of Langtang Lirung or even to day hike to Tsergo Ri. In the evening back to Kyangjing Gompa for sleep. Day 09	Kyanjin Gompa – Langtang Valley (3500m). Retreat your trail back. Day 10	Langtang- Lama Hotel (2400m). Retreat your trail back. Day 11	Lama Hotel – Thulo Syabru, (2230m). Gentle easy walk up & down to Thulo Syabru after taking left trail from Lama Hotel, right trail goes to Syarpa Gaon. We cross the village Bamboo and again taking left track from Landslide Lodge and climb 400 m back up to reach to our final stop at Thulo Syabru for today. Day 12	Thulo Syabru-Shing Gompa (3350 m): Today’s walk will be almost climbing gently up to Shing Gompa, also called Chndanbari. We cross through school and army post. The trail continues less steep walk and mostly through forest of hemlock and oak, we also pass through old chorten. We now come across the junction where the right trail goes to Dhunche and left to Chalang, we keep on walking straight cross another ridge in a forest of large spruces. The view of Dhunche below is very nice and we keep on walking till reaching second valley, then reaches a final ridge at 3260 m. We climb over a wall and walk past a government office of agriculture and that will be our stop of today, Shing Gompa Chandan Bari. Day 13	Sing Gompa - Gosaikund (4400m). The trail climbs up a ridge with the bare trees. We also cross through the forests full of moss and ferns. After some time we reach to Chalangpati (3584 m) where the view becomes wide open. The views of Langtang Lirung (7225 m), Ganesh HImal (7249 m) stands behind you. Then it ascends to Laurebina Yak (3930m) where we follow the path that in the high ridge, forest and the views opens rapidly, you will enjoy the views of Manaslu (8163 m), Himchuli (7893 m), and Annapurna Himal and more unnamed mountains behind you in the mean time. We still climb up to a ridge after Latebinayak, the altitude almost 4000 meters and the ascends becomes strenuous, we keep climbing up the rocky mountain of Gaosaikund. We pass through first lake Sarasatikund and second lake called Bhairbkund, climbing little more and comes to the third lake, which is Gosaikund (4380 m), sacred lake, with a black rock in the middle, said to be the head of Shiva, a Hindu god. . 5.30 hours walk. Day 14	Gosaikund - Ghopte (3500m). The trail climbs up to the Laurebina Pass (4610m), and again the trail descends along side a stream and alpine country to a national park post at Bheri Goth. Not taking upper trail, we continue going lower trail which is rocky route that descends along the middle of the valley to Phedi (3740 m), where we can stop for the lunch. Right below the lodge, crossing the streams and continue on the mountain flank, and walking ups & down and after long gentle descend you will come to Ghopte, our night stop of the day. 5 hours walk. Day 15	Ghopte - Kutumsang (2500m). The trail continues up ravines and across the boulders of old moraines then makes a final gentle ascent to Tharepati (3590m), a summer village. There is Chorten in the ridge above village, from there fine views of Jugal HImal and the Rolwaling HImal are clearly seen and behind you there is Lauribina Pass, which you have crossed yesterday. Then it drops through rhododendron forests on the right flank of the ridge, continue walking wide and straight level trail. Keep on walking wide and straight trail as there are many small and narrow path, you will come across kharka (pasture), chorten and small inn during the trail. You will be walking through the forest and ups & down path until you reach Panghu Danda, where prayers flags are flapping in the wind. Now there will be gentle descend till Kutumsang (2460 m), village. Our night stop of the day. 5.30 hours walk. Day 16	Kutumsang - Chisopani (2500m). The trail goes crossing two passes, first Gul Bhanjyang (2142 m), village where few dwellers can be seen. Now the path is steep up and crossing through the village and coming over the peak (2521 m), highest point of the course. We continue descending and come to the village Chipling (2165 m). From Chipling walking down through the paddy fields and by the right flank of the ridge you will come to second pass where the Pathi Bhanjyang (1768 m) village is situated. Keep on walking upward, ridge through fields where views of Himalayas opens wider behind you. The slope becomes gentler like a meadow and you reach Chisopani (2194 m.). we halt here for the night. 6 hours walk. Day 17	Chisopani - Sundarijal (1400m). The trail goes descending through hamlet, Mul Kharka forests dropping to a dam before Sundarijal. We shall have lunch here and after wards you will be transferred to Kathmandu by car or bus. Day 18	Morning & afternoon free, farewell dinner in the evening. Day 19	Transfer to airport for final departure.